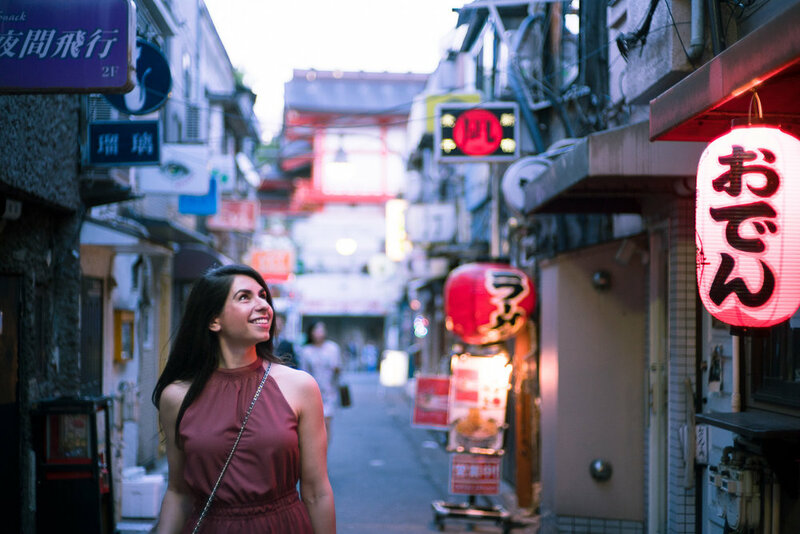 Tokyo Travel Photographer: Shinjuku Golden Gai — Tokyo Vacation Photographer - Kan P.
Whether you are traveling with friends, loved one or solo, Shinjuku Golden Gai should definitely be on your bucket list of must-visit photography spots in Tokyo. For street photography, it is best to visit Golden Gai at night, especially after 8-9PM since things get more interesting and there will be more characters to see on the street. But for taking travel photography, I would recommend getting there just right after 6.30PM, otherwise it may get too busy and distracting to photograph. It is a perfect place to explore a very unique Tokyo night life and make friends with some locals. Note that some places may not be very friendly/ welcoming to non-Japanese speakers. But in general, it is very easy to talk with people in Golden Gai. The combination of colors on the street are just amazing! The bar that Helena and I went in was DeathMatch in HELL, originally we only asked if we could photograph inside the bar. However, the bartender was very friendly and we ended up getting some drinks there! Super unique place with random horror-related items as decorations.. Please see my full gallery of Tokyo Vacation Photography, feel free to contact me if you need a Travel Photography in Tokyo!